I remember seeing a color photo of this crossing in book on Jersey rail lines many years ago, which was very expensive and I was not making much money at that time. The photo was taken from the overpass looking down at the shed to the west. I would like to find this photo and others of that crossing from the late 1950’s early 1960’s. Also, does the crossing have name or number? Any books or references available with photos of this crossing? No pictures, but I did find a track diagram of the area with the Hawkins St. crossing labelled. The line at ground level sounds like the Central RR of NJ (Jersey Central) Newark Branch (going to a dead-end station on Broad St), and the elevated line along Route 9 was the Pennsylvania RR P&H (Passaic and Harsimus?) freight branch. Well, there isn't a railroad crossing guard booth at that point anymore, but there is (or at least was a few years ago) a guard booth for the entrance to Naparano, and the guard there-in would come out and eye anyone who lingered a bit long in the road looking through the chain link gate. I think the only real business to the west is some place that takes tank cars of vegtable oil. I swear there was also a small 1 story bar/tavern called the 'Third Rail Cafe', right on Hawkins before the grade crossing - there's now one of those narrow modern 2 family homes of the style that was built all over the Ironbound district in the past 2 decades on the site. I may be misremembering, but that's what I think the bar was called. 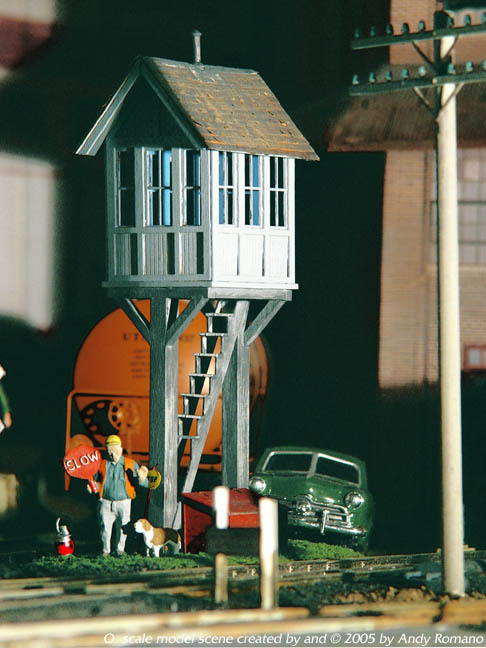 The guard booth, or as Plasticville used call to 'em, "Watchman's Shanty", was razed decades ago when they went to automatic gates. You really got me puzzled on the "3rd Rail Cafe" tavern, though - I have no recollection of that. There was (and still is if I'm not mistaken) a one-story tall bar on the next corner less than a 1/2 block down - same side of Hawkins St. - known as "Eddy's Long Bar". My dad used to stop there and treat me to one of their legendary humongous burgers. Check out this site I stumbled onto. If you are a fan of the Ironbound and the CNJ you should love it. Does anyone here know Andy Romano, creator of the site (and the models)? MikeDob wrote: The guard booth, or as Plasticville used call to 'em, "Watchman's Shanty", was razed decades ago when they went to automatic gates. You really got me puzzled on the "3rd Rail Cafe" tavern, though - I have no recollection of that. There was (and still is if I'm not mistaken) a one-story tall bar on the next corner less than a 1/2 block down - same side of Hawkins St. - known as "Eddy's Long Bar". My dad used to stop there and treat me to one of their legendary humongous burgers. I could be wrong on the name '3rd Rail Cafe', but I would have sworn there was a 1-story 'cafe/bar/tavern whatever right by the tracks. And here is the crosssing, looking south on Hawkins. http://maps.google.com/maps?q=107+hawkins+st,+newark,+nj&hl=en&ll=40.727312,-74.138888&spn=0.000004,0.00265&sll=40.728088,-74.139041&layer=c&cbp=13,204.34,,0,9.12&cbll=40.727464,-74.138875&hnear=107+Hawkins+St,+Newark,+Essex,+New+Jersey+07105&t=h&panoid=mCSsIxev7x_6mmjEyl2aSw&z=19. If you rotate the view (click and hold on the "N" on the circle on the top left, and drag it around the circle) you can see the new house Sir Ray mentioned.